As our campaign is still growing, the most important thing you can do right now is ask your friends, family and networks to join us. Please forward the email below and let them know you have joined the Australians for Mental Health campaign and ask them to do the same. We would also love you to consider giving to our crowdfunding campaign to help make Australians for Mental Health a well-resourced, effective and successful campaign. If you have already given to the campaign, thank you! Please consider sharing the link via your networks. Together we can put mental health on the political agenda, and end this madness. Please share the campaign far and wide. P.S. Will you help us build the support we need to #endthismadness? Please share the email below with your friends and family. You probably know what mental ill health is. But do you know what it looks like in Australia? Every day, seven Australians take their own lives. More than 200 attempt to. Mental ill health is costing our country dearly in lives, in productivity and in dollars – close to $40 billion per year. Our mental health system is in crisis. We need your help to end this madness. Australians for Mental Health is a new, national advocacy campaign that aims to make real change in the lives of people suffering mental ill health. Ahead of the next Federal election, Australians for Mental Health will lead a coordinated, grassroots campaign to place increasing pressure on all politicians and political parties to make mental ill health a key election issue. With your support, we can lobby political leaders to address the lack and ineffectiveness of current mental health services, boost funding, and deliver on commitments. 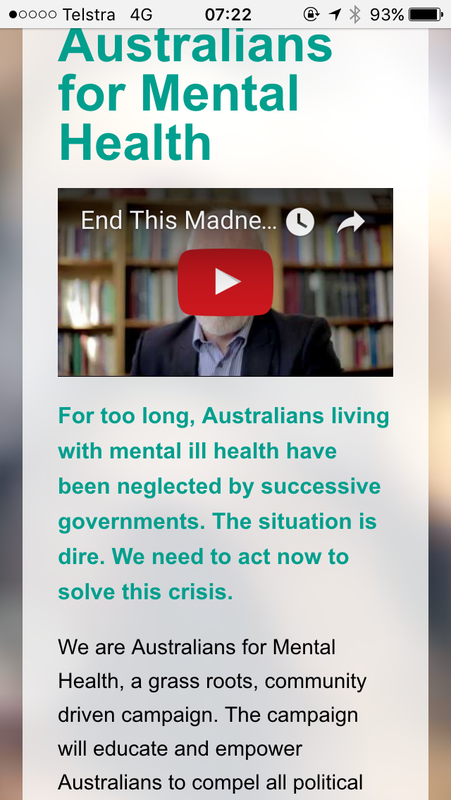 I’ve joined the Australians for Mental Health movement and I’m asking you to please join me.